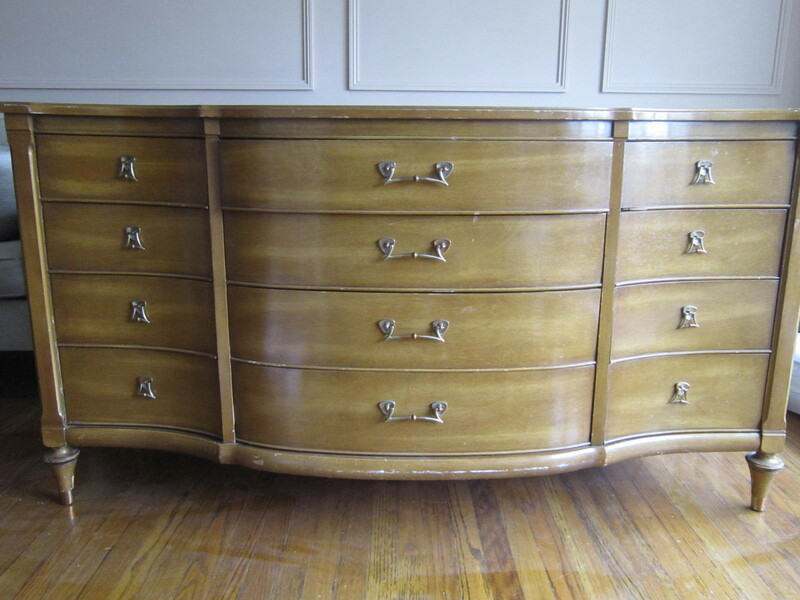 When I found this dresser and saw the price I thought maybe it was a mistake. The owner was asking $35 for this beauty! 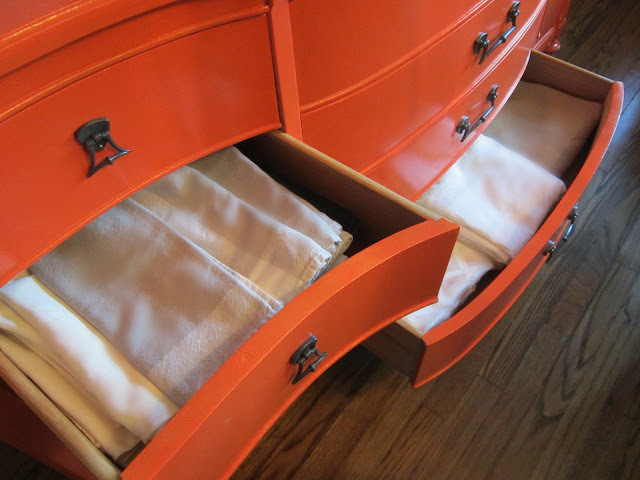 The size was perfect and the drawers all glided nicely. The veneer was in excellent shape with some minor dents and scratches but nothing that a little sanding wouldn't take care of. 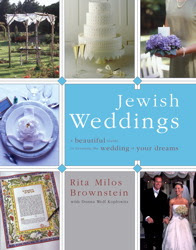 Since I wanted it done before Passover I had to get going with the rehab weeks before. 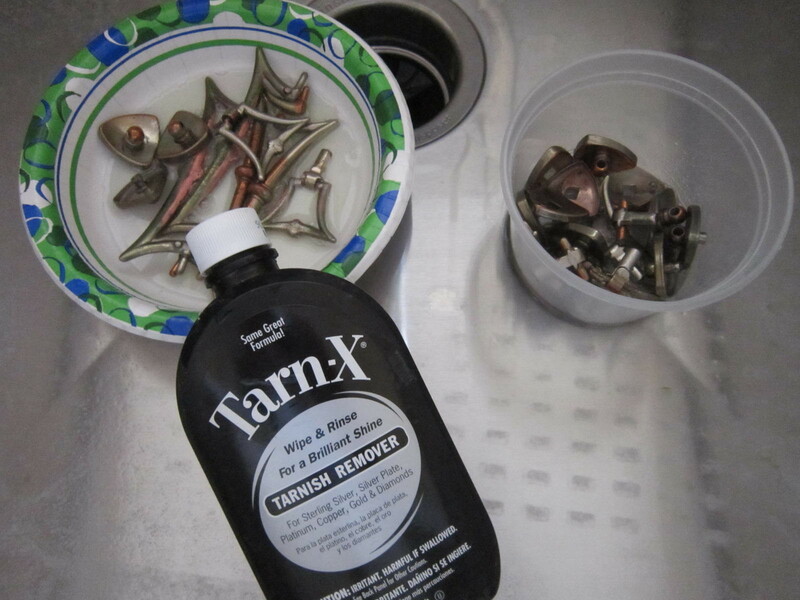 First I tried soaking them in some Tarn-X. Bad move. The brass became discolored and looked awful! 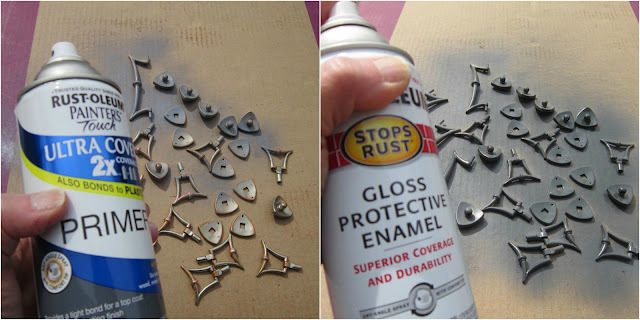 I used a primer first, then enamel since I wanted to be sure the paint would adhere with daily use. 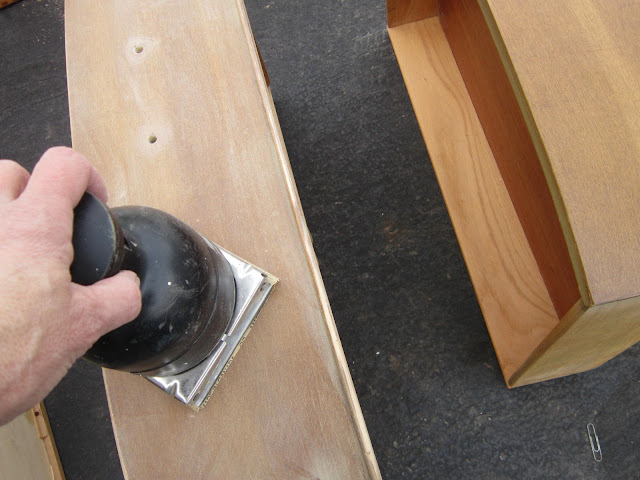 For the dresser, the first step was sanding...it's not necessary to sand down to the bare wood, but just enough to get the glossy finish off so the paint will adhere. After the sanding it's time to paint. 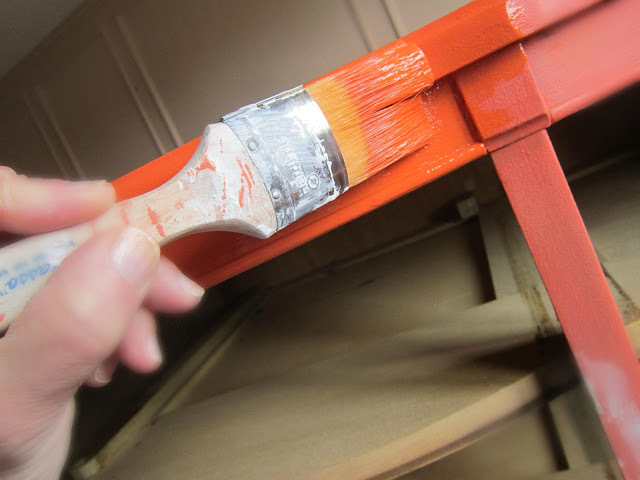 The guy at the paint store told me that orange is one of the hardest colors to cover and he suggested a tinted primer. Even using a tinted primer it took about four coats of paint to cover! 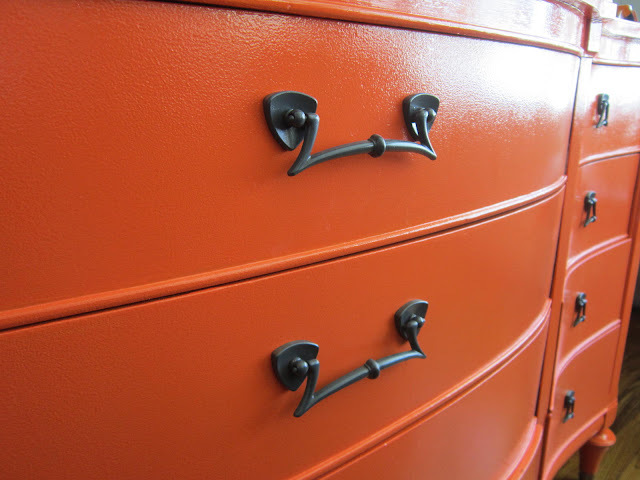 The top coat is Benjamin Moore's Festive Orange in a high gloss oil paint. When my husband came home and saw the color he thought I was crazy! But with all the gray tones in the dining room and kitchen I wanted a pop of color and I've been obsessed with orange lately. The orange looks great against the gray walls. Was I hesitant painting this orange? Oh yeah. But sometimes you have to go outside your comfort zone and do something a bit daring to get that wow factor! That's perfection! I've been looking for an old dresser for a tv stand in my living room. I haven't found anything for the right price! The price was too good to be true! Thanks Rhonda. This is great! Love the color. I be sure to tell my husband this! Coming over from Finding Fabulous and this is totally fabulous! I love the color. Thank you Julia--I'm loving it too! Nicely done, Rita! I LOVE the orange! Bold and beautiful. This is amazing! what a awesome find and even more awesome transformation. 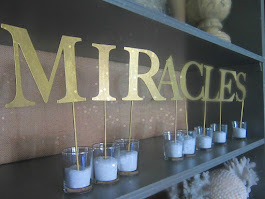 I am having my first linky party on sunday, I would love if you would come share this. Wow is right! What a great piece and beautiful color!!! We did an orange wall and used a tinted primer as well. Worst idea ever. We ended up discovering that the grey primers are best. And that covered so much easier! Beautiful. Bold. 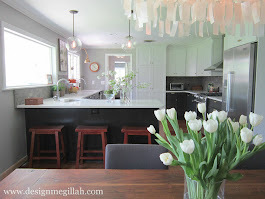 Clicked through from Shabby Nest and I can't wait to browse your blog! Wow! I agree with everyone else; it looks fantastic! I, too, was looking for a storage piece for the DR for awhile. I bought a little glass-fronted cabinet on a "daily deal" sale from Target's website. By the time I made my decision, the only color left was bright yellow. I painted it grey. I'm still looking for different knobs, but it's growing on me. Beautiful transformation! 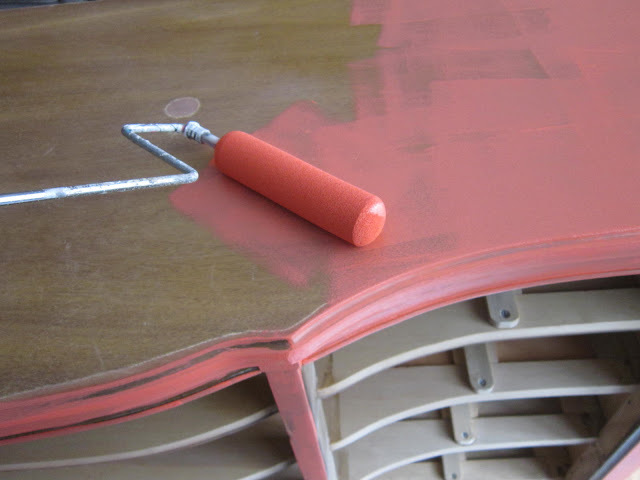 I am now inspired to re-paint my buffet which I bought all the supplies for last year. I also love how you arranged your artwork. Thank you--Michael doesn't get the orange but everyone else loves it! the gray (My living room colors with hints of turquoise as well!). BTW, as you found out, Tarn-X is NOT for brass. Next time try Brasso or Mother's polish with some fine steel wool. brass shine underneath using that method. I love it! Orange is one of my favorite colors and it looks great on the buffet....and 35 bucks?, holy crap-what a deal!! Nice job! Simply beautiful! Love the orange color! I LOVE the orange! I get so excited when people show off their color courage! I am a red girl, myself, but that beautiful orange piece (and lamps I saw in another one of your posts) has the wheels turning in my head....hmmmm. What a lovely blog you have! I'm hooked! just saw this via pinterest- LOVE it so much! Thank you Cassie--I use it daily and also love it! I've looking to do this exact project, and orange is my first choice of colour. What did you use as keywords when you were searching for this piece of furniture? The only keyword I used was dresser. 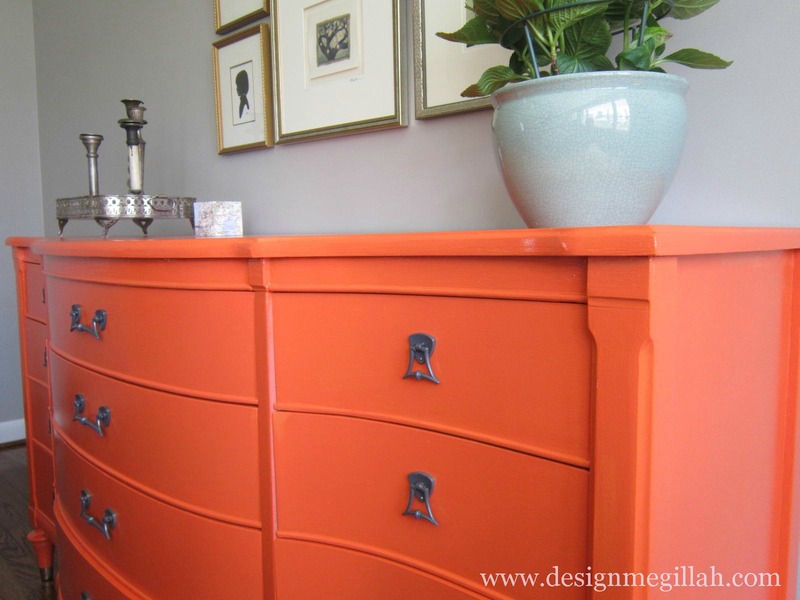 This is fabulous and I really dislike orange but omgosh what a great find and what a great vision you had. 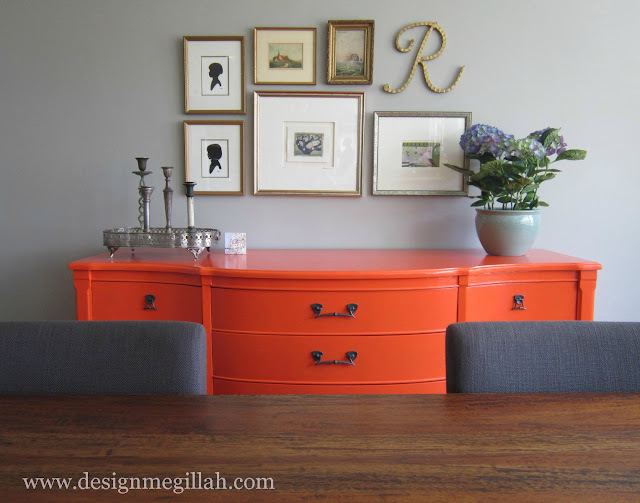 Yes, I had a few negative comments about the "wrong" orange but I love how mine turned out! Wow! It's beautiful! Nice work. You make it look so easy. The orange color is the BEST part! Hiii! I love the pop of colour, well-played! My question is... though i see you used a paint brush, the close up of the after does not show a hint of brush stroke. What's your secret? I'm just starting to get into furniture refinshing! Absolutely gorgeous! Love the pop of color! WARNING, Tarn-X and other dips are extremely destructive to silver! 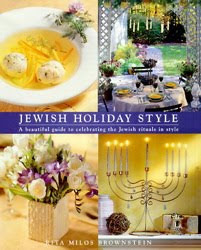 See the results here: http://www.hermansilver.com/tarn-x.htm. Whistler Grand CDL has a wide geographical portfolio which includes hotels, offices, residences, shopping malls and much more. By considering its previous record of past 50 years, this company has developed over 40,000 homes and has the ownership of 18 million square feet of lettable floor area globally. Do you know anything about the piece itself? Style? How old it is? Type of wood? I bought the the same dresser with the entire bedroom set on Craigslist too and painted it a creamy white. This dresser has a big mirror to attach to it, a tall boy dresser and two side tables. I’ve always wondered!